And at first, you didn't (or did?) disappoint. Here was that same weird use of sentence fragments, the hating of which makes me a huge hypocrite because it's okay in my published-only-on-the-internet writing but not in a BOOK. With PAGES (or maybe e-pages - and hopefully a COPY-EDITOR who is trained to spot sentence fragments posing as stream-of-consciousness writing.) In fact, when I came across the Sentence Fragments of Potential DNF, I flipped immediately to the dust jacket to see if... yep, a first novel. First time authors, STOP DOING THIS. And the rest of you, too, unless it is for emphasis and please only once per chapter at a maximum. And then the story got rolling and it was fun and I stopped muppet-flailing over grammar (which is how you know I actually liked it). 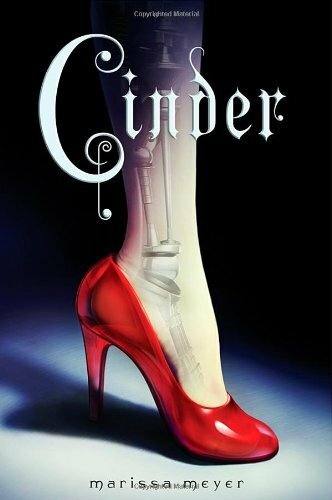 Cyborgs, an evil stepmother (natch), one good stepsister a la Ever After, and a prince-sometimes-in-disguise! People who actually die of the scary disease! Meyer doesn't just walk the fine line between re-telling and re-packaging; she dances along it like a tightrope walker from Cirque du Soliel. Not every character is recognizable from the original (or Disney) story, and the world-building is done with plausible elegance. The biggest quibble I had - once the sentences started having a proper structure as sentences should - was that it's set in Future Shanghai, but there was very little actual Chinese culture folded into the story; I would have liked to read more about how Meyer envisions Chinese culture adapting (or NOT adapting) to the future she has created. As an added bonus, it's book #1. If there's one thing I like, it's seeing "Book 1" on the cover of a book I thoroughly enjoyed.